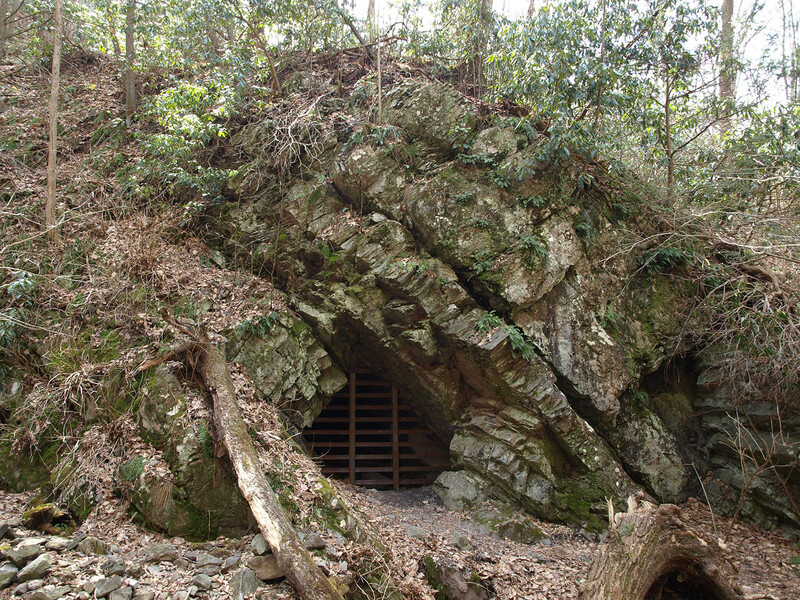 A few miles north of the Delaware Water Gap lies a mining complex surrounded by legend. The first thing the visitor might notice from the Coppermine Trail parking lot is a small shed built into the side of the hill. It stands out better in pictures with snow. The stone shed might have served as an icehouse in its day. 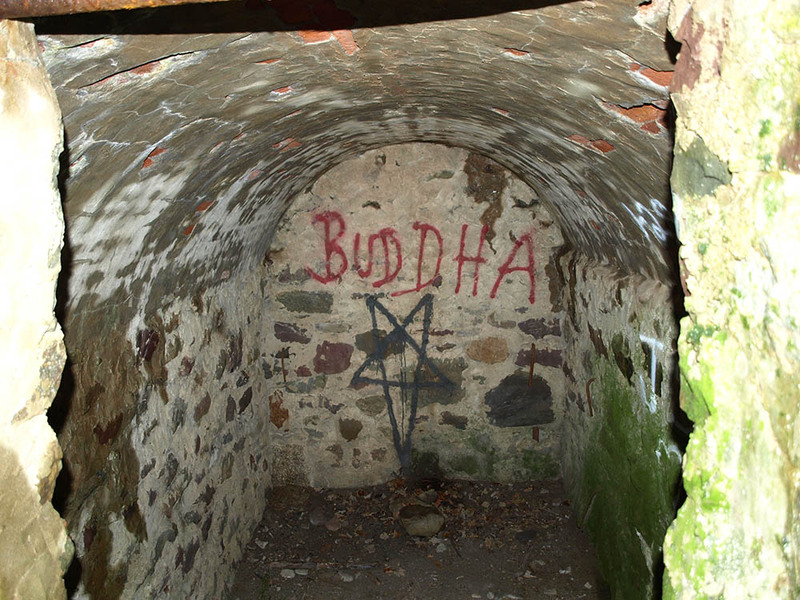 Inside it has an arched ceiling and some odd graffiti. 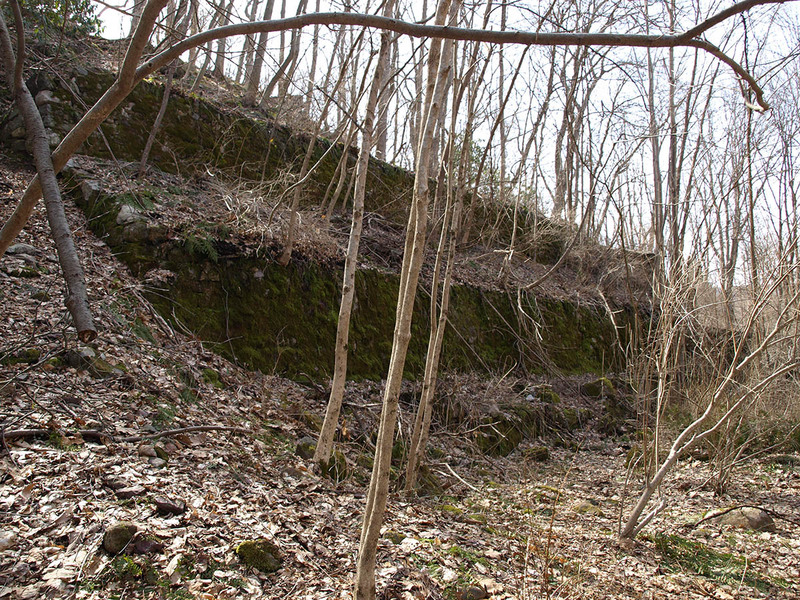 The foundation of a large mill is terraced into the hillside nearby. 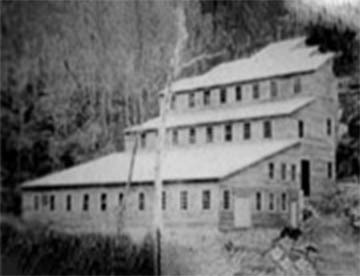 The mill was obviously a large building, and this photo from around 1905 shows what it looked like when the mine was in operation. Today the foundations are covered in moss as the stones are reclaimed by the forest. The explorer should be careful around these walls, as there are plenty of opportunities for injury. 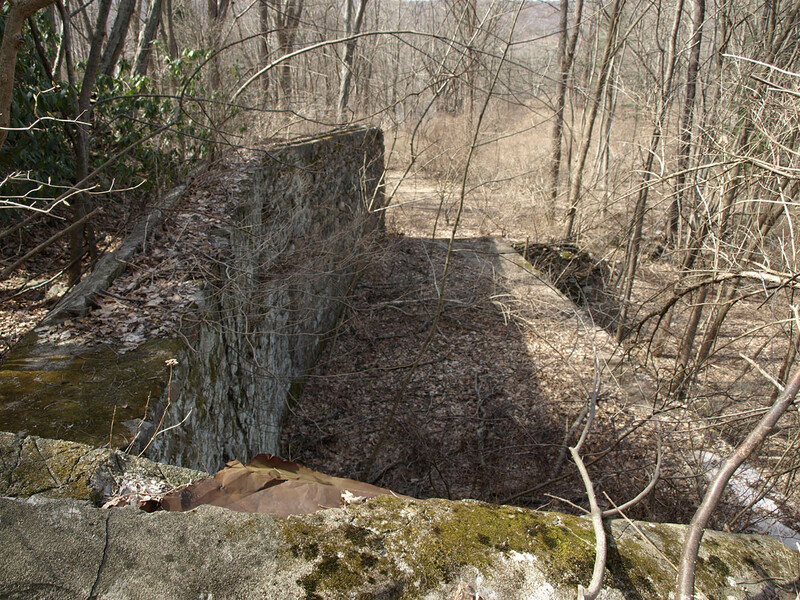 A side trail along the brook leads to a mine entrance. On the way is a trench that might have been an exploratory working. Farther up the creek is an old adit (a roughly horizontal mine shaft). Unfortunately it is shut with a steel cage that makes me think of Jurassic Park for some reason. Looking through the cage you can see that it would be an exciting place to explore. The mines here were worked in a series of stages from the mid 1700s until the early 1900s. Legend holds that Dutch settlers, lured by Indian tales and a sense of adventure, first prospected for copper in the Pahaquarry area during the 1650s. 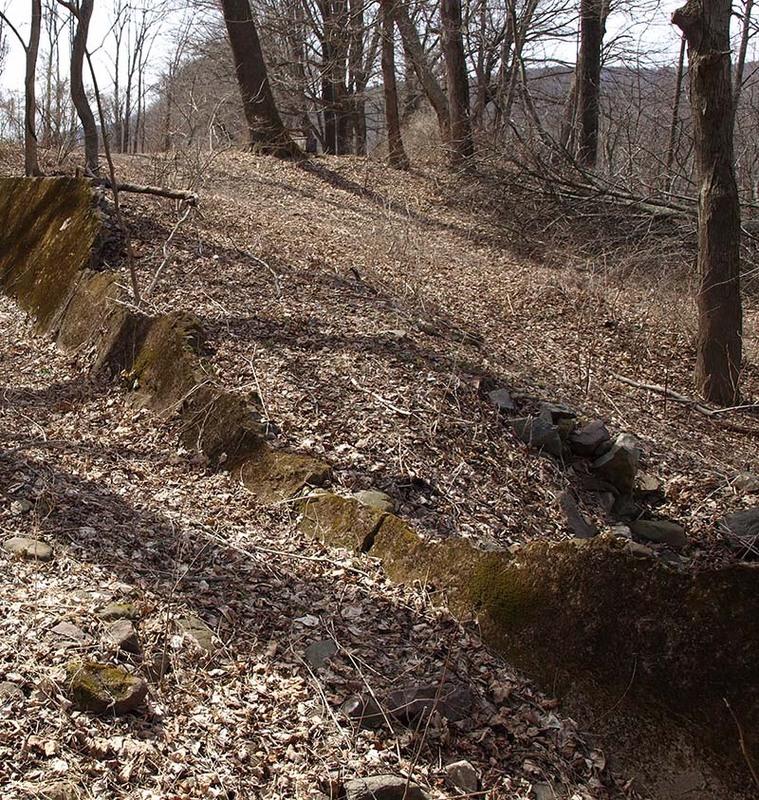 They were supposed to have built a road over 100 miles northeast to Kingston (then called Esopus or Wiltwyck) to transport copper ore to the Hudson River for transport, as the Delaware river is not navigable by large vessels at this point. A marker along Old Mine Road relates this story. However, as many historians have argued, this story is most likely not true. Herbert C. Kraft makes a thorough case against the legend in his book The Dutch, the Indians, and the Quest for Copper. Kraft notes that there is no archeological or documentary evidence of Dutch mining in the area. The legend is based on a pair of letters that appeared in a journal in 1828. The dubious story claimed to present “traditional accounts” of a copper mine and a road to Kingston built by Dutch miners. Wishful readings of other sources have given the legend the appearance of historical truth. Besides a lack of evidence, there are other reasons why the Dutch origin story is unlikely. The Minsi Indians who lived in the area did not mine or work with copper, so Dutch settlers a hundred miles away would not have heard of copper deposits from them. This is partly because the copper at Pahaquarry exists in low concentration in very hard sandstone – hard enough that the wrought iron tools in use in colonial times would not have lasted long. Even tempered steel drills were quickly worn out during a futile effort to make the mine profitable in 1901. Wagons used in the New Netherland colony could not have hauled the heavy rock very far, and there is no evidence that smelting facilities were built in New Netherland. In addition, it would have been difficult for the Dutch to travel so far through hostile territory. Relations between the Dutch and Esopus Indians were hostile and broke into open war in 1655. While the Minsi did not wage war on the Dutch, they were friendly to the Esopus. The situation stabilized somewhat after the English took over New Netherland in 1664. Limited mining at Pahaquarry probably began in the mid 1700s, though progress would have been stalled by the French and Indian War (1756-1763). The Minsi had started to leave the area by this point. They had signed an agreement with English settlers in 1713 but felt like they had been shorted because they disputed which tracts had been ceded and they expected to be allowed to continue hunting. The Old Mine Road started at Kingston and gradually went southwest as settlers pushed farther into the interior. 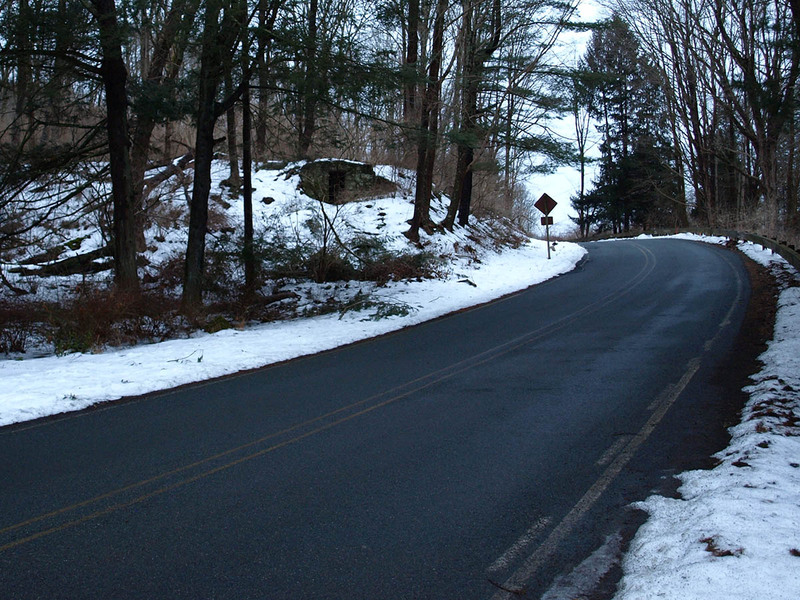 It finally reached the Delaware Water Gap in 1830 when the first road through the Gap on the New Jersey side was built. 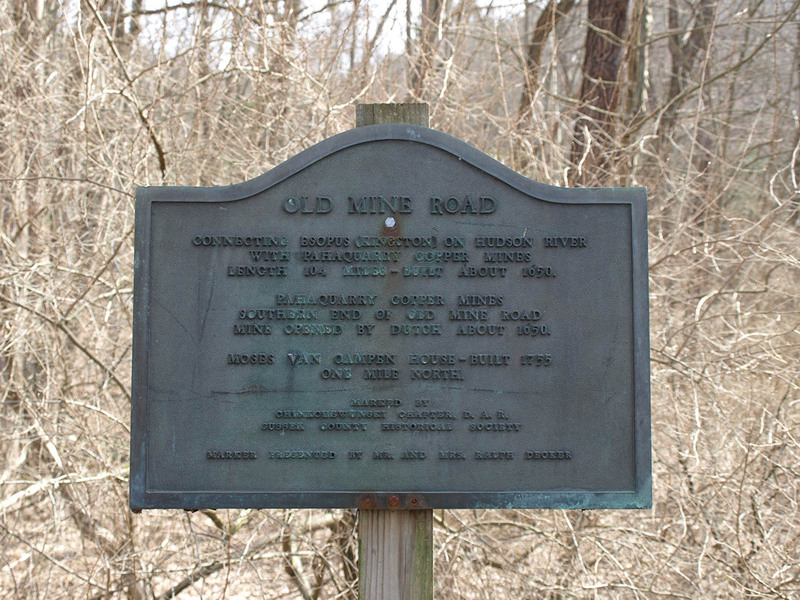 Presumably a small spur would have led to the mine when it was active, though the earliest mapped road to the mines was built in 1790 and required crossing the Delaware river a mile south of the mines. Later mining ventures proved unsuccessful despite the expansive operations. 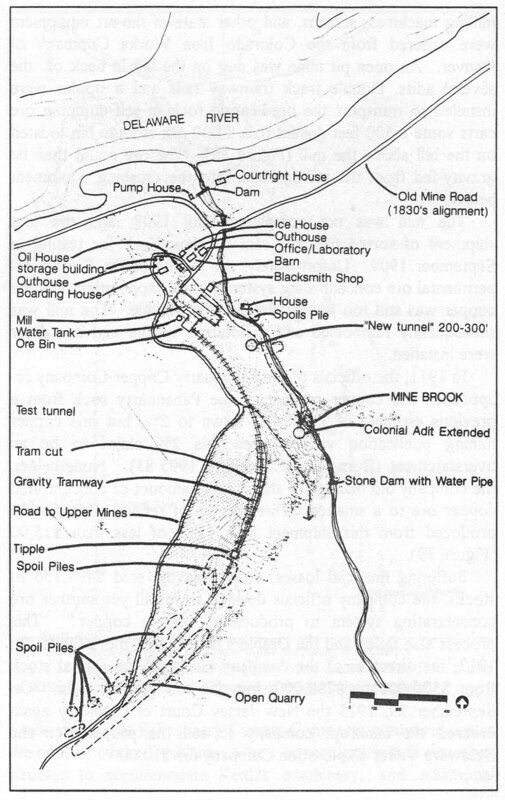 A new dam near the mouth of the Mine Brook was built around 1902. A few chunks of concrete sticking out of the ground were probably part of the dam. 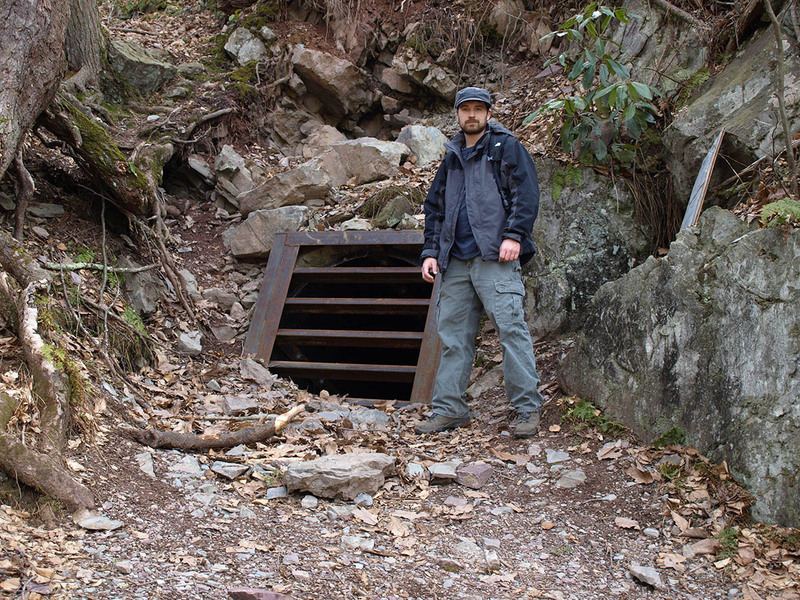 Another adit can be found up the hill along the Coppermine Trail. It has a surprisingly small opening. 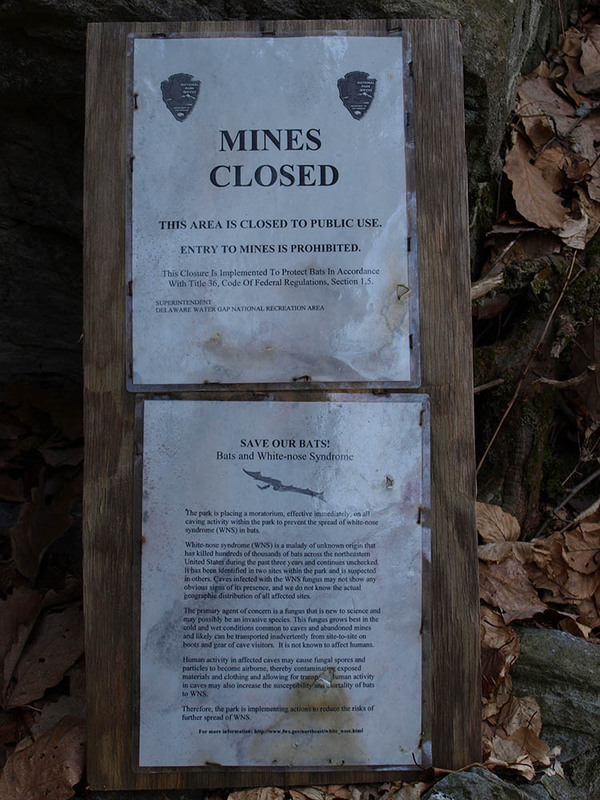 A sign next to this opening says that the mines were closed because humans might spread diseases that harm bats. Years ago the National Park Service gave tours of the mines. 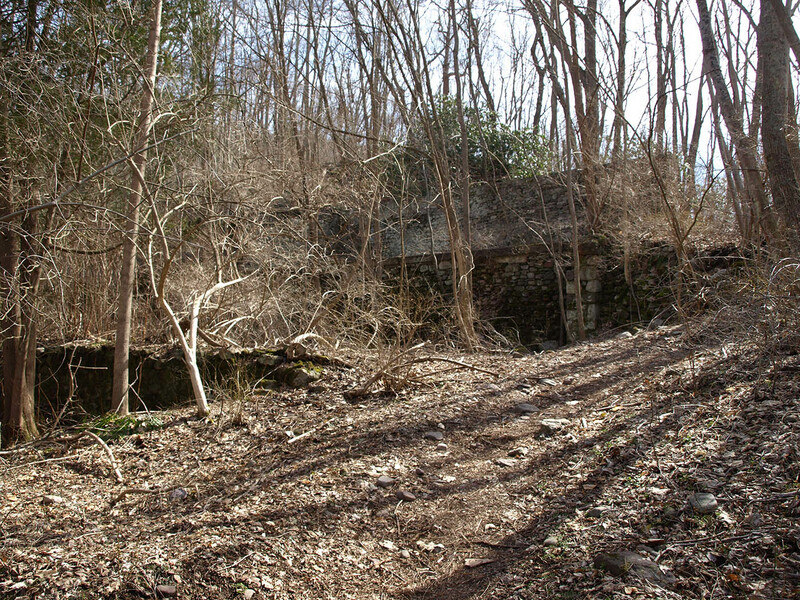 The Pahaquarry mine property was bought by a Trenton Boy Scout council in 1925, and the last government survey, during the tough years of World War II, once again concluded that mining the area was not worth it. The federal government bought the land in the 1960s for the Delaware Water Gap National Recreation Area. 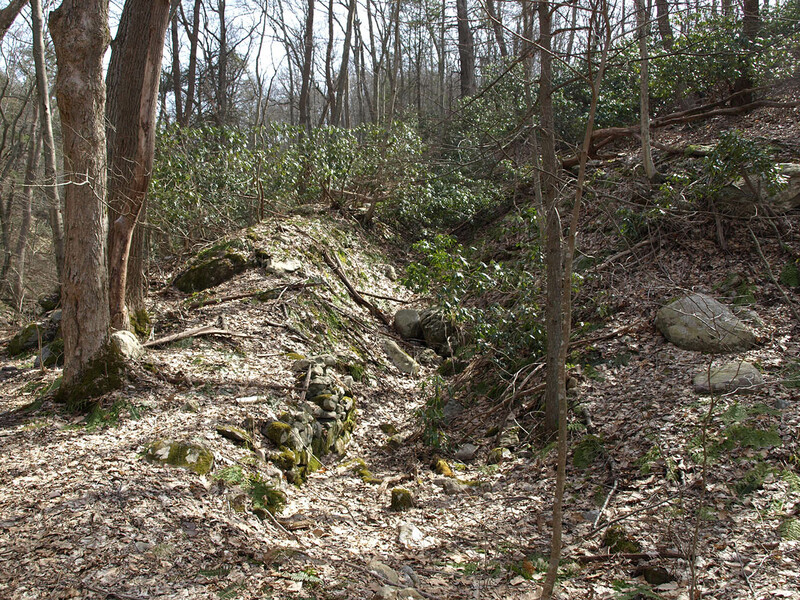 The Coppermine Trail continues up the ravine on its way to the Appalachian Trail. The hiker can easily forget the busy complex below as the trail curves by narrow waterfalls and undisturbed boulders. 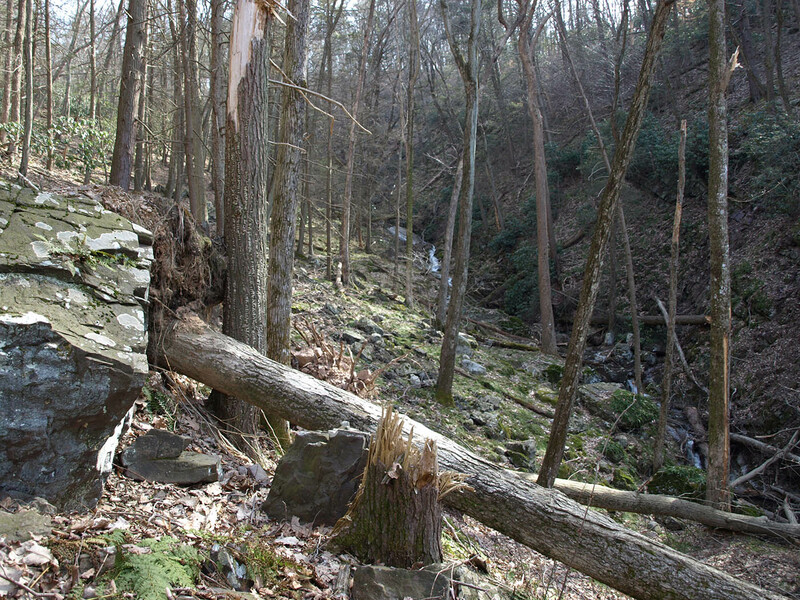 Boysen, Robert L. Kittatinny Trails. New York – New Jersey Trail Conference, 2004. Pages 67-68. Kraft, Herbert C. The Dutch, the Indians, and the Quest for Copper: Pahaquarry and the Old Mine Road. Seton Hall University Museum, 1996. Pages 43, 46, 68-71, 90-92, 96-101, 105, 116, 123, 155-157. Map photo is from page 122. Thanks to whoever listed this book on the Wikipedia Pahaquarry page. 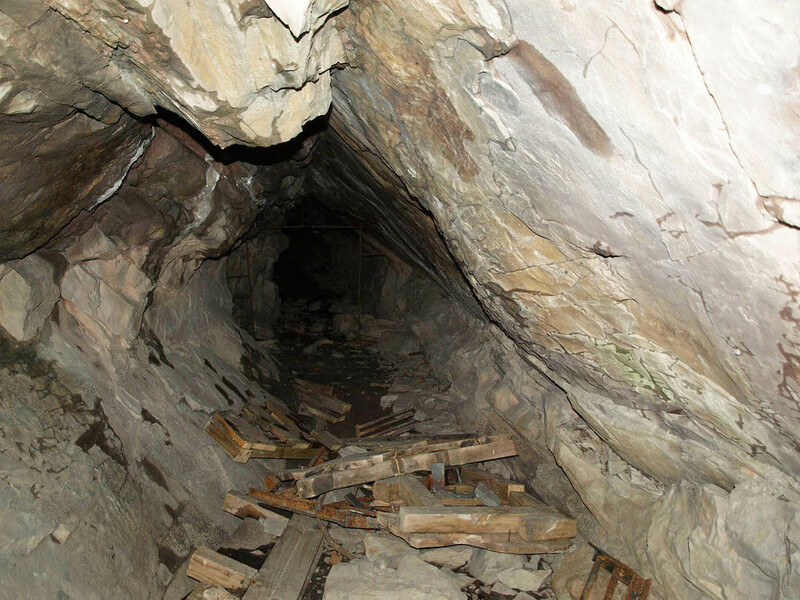 “The Dutch Mines: Fact or Myth?” Spanning the Gap, National Park Service. Originally published in 1988, revised in 2004 by Susan Kopczynski. Very informative! Excellent pictures and information well documented! My wife and I have been hiking the Copper mines trail for over 25 years. and have actually been inside the two mines over 20 years ago before they closed them up. It was only a year or two ago that I actually found a shard of Delft pottery at the upper open ground mine, suggesting a Dutch presence some time in the past.